Cursive Club Tries To Keep Handwriting Alive The writing may be on the wall for cursive handwriting. With a growing number of schools opting not to teach cursive, it may be on its way to becoming a disappearing art. So one New Jersey grandmother is making sure her grandson's schoolmates know how to loop their Ls and curl their Qs. Cursive handwriting is disappearing from the list of required courses at U.S. schools, so one New Jersey grandmother is making sure her grandson's schoolmates know how to loop their Ls and curl their Qs. At first, 45 students signed up for the cursive club that Sylvia Hughes founded last fall at Nellie K. Parker Elementary School. But then the club grew to 60 8- and 9-year olds. Some states require cursive handwriting instruction, but in New Jersey, it's optional. That was news to Hughes. "I was shocked because every legal document requires a signature. And do we expect the parents to teach it? Do we expect kids to learn on their own?" Hughes says. Hughes says she learned this while helping her grandson with his homework. She asked Principal Lillian Whitaker why cursive handwriting wasn't part of the curriculum. "It's not that we don't want to. It's just that with all the state mandates, we don't have time," Whitaker says. Mike Yaple of the New Jersey School Boards Association says the state adopted the Common Core State Standards Initiative to provide consistent learning requirements for students across the nation. Common Core has been adopted by nearly every state and the District of Columbia, and the standards don't require cursive. 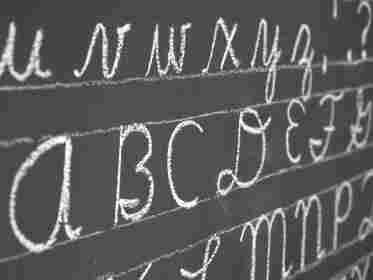 "Even New Jersey's state standards have said students are expected to write legibly in manuscript or cursive, but there really never was a mandate for cursive to be taught in all schools," Yaple says. Students are now required to take nine subjects in preparation for a state-issued standardized test this spring. He says many people support teaching cursive handwriting to improve eye-hand coordination and teach students how to understand documents in cursive. "But when push comes to shove, some parents might want their child to have an edge when it comes to other subjects like technology or speaking a second language," Yaple says. "And that's when you see the push toward fewer hours for cursive." Hughes says it made the students happy. "When I come to the school now for different programs they have, they come up to me and say, 'Hi, Miss Hughes.' I mean, it really does my heart well," Hughes says. Alexandra Solomon, 9, says the feeling is mutual. "Ms. Hughes is kind of like my hero, sort of, because without her I wouldn't be able to write cursive and I wouldn't be able to read cursive," Solomon says. Parent Helen Burgos remembers spending 45 minutes a day learning cursive in parochial school. She didn't hesitate to sign up her daughter for the club. "I do things the old-fashioned way. I do not pay my bills online. I still write thank you letters instead of sending an email," Burgos says. By popular demand, Hughes and her cursive club will return in September.